In his latest book, Caltech neuroscientist Christof Koch sets out to conquer biology’s white whale—consciousness. Part memoir and part history-of-science lesson, Consciousness: Confessions of a Romantic Reductionist pays homage to the early pioneers of the study of consciousness—Francis Crick, with whom Koch collaborated for almost 20 years, and David Chalmers, among others—while detailing the important discoveries and technological advances making the field ever more relevant. Koch signposts the journey using experiences, both mundane and transformative, from his life spent struggling to understand the monumental questions underpinning the study of consciousness. From toothaches to loss of faith in God, the author’s past, as he searchingly explores it, dovetails nicely with a firsthand tour of the field and its exciting future. The theories that Harvard evolutionary biologist E.O. Wilson has been expounding throughout his career are as intriguing and insightful as they are pot-stirring. And the new ideas that the naturalist posits in his latest book, The Social Conquest of Earth, are no different. Wilson essentially provides a theoretical evolutionary framework for the development of the human condition. Wilson draws parallels between the ants and other social insects with which he’s intimately familiar and cooperative behavior in humans. The book fans out to cover religion, consciousness, language, culture, the birth of sociality, and more from the kaleidoscopic evolutionary perspective for which Wilson has become famous. He roots his argument in one of his more controversial proposals: individual and group selection, not kin selection, are the crucial forces propelling human evolution onward. In doing so, he suggests that social evolution, not just natural selection, was key to humans becoming the rapacious, ubiquitous, contemplative, introspective species we are today. By incorporating social and biological science in his theory of humanity’s evolution, Wilson also inches closer to his El Dorado, his Holy Grail—the realization of consilience, that grand unifying of knowledge to arrive at the ultimate truth of our existence. The Earth is literally crawling with insects. Nearly 1 million known species skitter, buzz, and creep through virtually every ecosystem on Earth. Such dazzling diversity is seen as a bountiful buffet by the scores of bird, fish, mammal, amphibian, and reptile species that prey upon insects. Regardless of perspective, insect life is the result of millions of years of evolution marked by constant pressure to survive and reproduce. And nowhere is the evolutionary arms race between predator and prey more vividly illustrated than by insects and the myriad creatures that eat them. 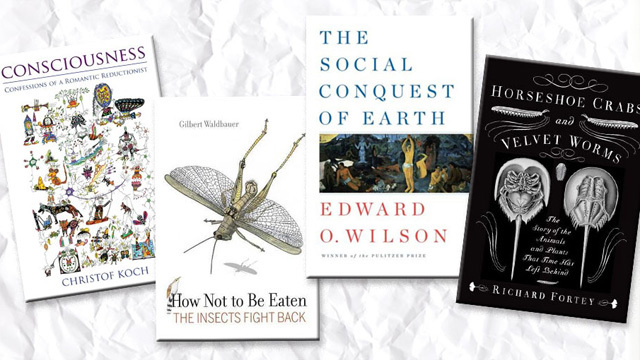 This is the story told by entomologist Gilbert Waldbauer in How Not to Be Eaten: The Insects Fight Back. From burrowing owls that bait dung beetles with lures made from cow manure to the unicorn caterpillar, which sprays would-be attackers with a spritz of acid, the profusion of life in all its forms and finery flies in through the window on biology that Waldbauer opens wide. Time travel becomes possible in the pages of Horseshoe Crabs and Velvet Worms: The Story of the Animals and Plants That Time Has Left Behind. Paleontologist Richard Fortey plays tour guide through the crucibles of evolution where life-forms transformed into the manifold species we observe today. Fortey focuses on the creatures that survived periods of evolutionary change to emerge relatively unchanged. His hunt for the titular horseshoe crabs and velvet worms—both species that are likely more than 400 million years old—whisks readers away to murky bays in Delaware and pine forests in New Zealand. But Fortey’s journey does not end there. He goes traipsing around Australia’s west coast poking at slimy mats called stromatolites, accretions of microorganisms that offer a glimpse of perhaps the oldest records of life on the planet. He visits the Rocky Mountains to find the ancient, hot-spring-loving bacteria whose enzymatic machinery made early versions of the polymerase chain reaction possible. Several ancient plants, fish, and amphibians later, Fortey has assembled what amounts to a menagerie of resistance: organisms that have stood the test of evolutionary time by arriving at a unique survival strategy and sticking to it, millennia be damned.